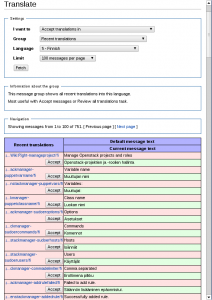 This blog post is about the MediaWiki Translate extension and explains how we got to develop a new set of translation review tools. One of the core principles at translatewiki.net is that the time of translators is a prestige resource. We show our appreciation to translators by providing tools that let them concentrate 100% on the task at hand and let the (volunteer) staff handle the boring tasks. It is well known that good translators take pride of their and others work. This may result in a urge to review all translations made by other translators. I consider myself being that kind of translator. The good news is that in recent months the Translate extension has got massively better at supporting reviewing of translations. Some weeks ago we added a new listing where you can click a button to accept a translation. When the list is empty, you know that all translations have either been made or fixed by you, or you have accepted someone elses’ translations. This is all nice and dandy, but if you want to review new translations as they come in it is not practical. You’d either have to watch the list of recent translations or subscribe to the feed of them. From here you can get to the individual messages, but it takes many clicks to get to the page where you see the button to accept the translation. And iterating over each of the hundreds of message groups to see if there is anything to accept is not practical either. The solution: a special message group which lists the recent translations in a given language. Since only some of the translators are allowed to review, on the right you can see a screenshot of how it looks like – click to enlarge. One could bookmark this page and have a look at it a few times per week. For me this is a real time saver, and I’m sure others will find it useful too. To get this implemented, I originally anticipated that some heavy refactoring was needed and I estimated about one and a half day for it. In the end it took only about half a day – I was positively surprised how painless the refactoring was. The problem was that the class which fetches all the messages from the database assumed they all belong in the same MediaWiki namespace. 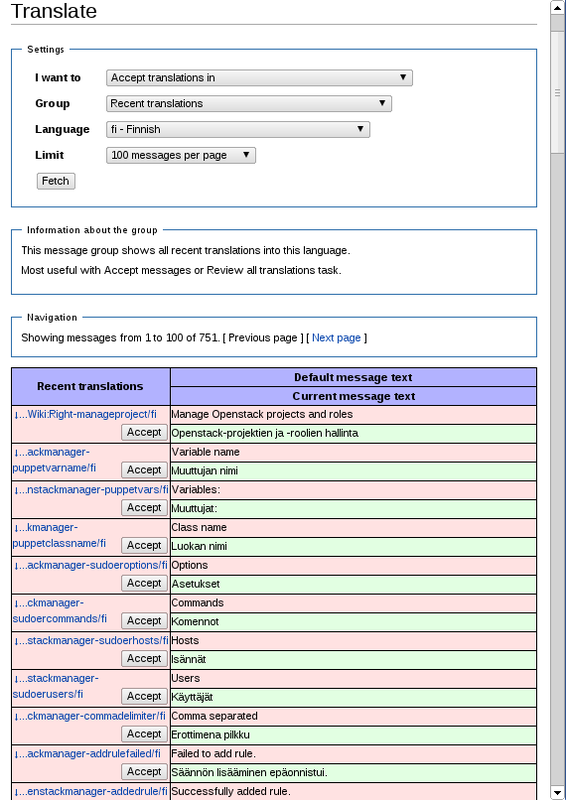 In translatewiki.net we have over ten namespaces for translations of different projects, so it had to be fixed. I’d say this is a prime example of the saying Premature optimization is the root of all evil by Donald Knuth. In the future we need to link this page from suitable places to make this feature discoverable and also to make sure that more than the current 66 users out of 3000+ translators get the right to use this feature. You are currently browsing the It rains like a saavi blog archives for December, 2011.